He's done it again: Rainer Zietlow and his team are among the guests of honour at the world premiere of the third generation Volkswagen Touareg in Beijing today. The adventurer and his companions drove to the world premiere to Beijing over land in a camouflaged prototype of the new Volkswagen Touareg. The team spent a total of 21 days on the "Bratislava2Beijing" tour. "The new Touareg with its numerous driver assistance systems proved to be an absolutely reliable and comfortable car on this world premiere drive", says Rainer Zietlow. "The new Volkswagen SUV is absolutely suitable in every respect for long distances and impressed us in unpredictable road and weather conditions." For three weeks Zietlow and his team put the new Touareg to the ultimate test. The route of the "Bratislava2Beijing" project took the Touareg pioneers through eleven countries: Slovakia, Austria, the Czech Republic, Poland, Lithuania, Latvia, Estonia, Russia, Kazakhstan, Mongolia and China. The starting point was the Volkswagen plant in Bratislava, where the Touareg has been manufactured for 16 years. Almost one million units have rolled off the production line since the start of series production in 2002. Zietlow and his comrades drove the new Touareg through wintry Europe and deep-frozen parts of Asia. Daily stages, some of which were more than 1,000 kilometres long and temperature ranges of minus 23 to plus 21 degrees Celsius, demanded everything from man and machine, giving the team unforgettable moments at the same time. Unique landscapes, hair-raising road conditions, sit-ins with ice fishers. 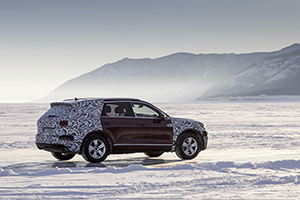 And never feeling out of place: the new Touareg – with camouflaged front and rear before its world premiere. The journey to the world premiere in Beijing took them along the snow-covered Urals, past frozen Lake Baikal through the expanses of Kazakhstan, the mountains and steppes of Mongolia and finally over Inner Mongolia to the Middle Kingdom. 16,500 exciting kilometres, marking another milestone in the long-distance history of the Volkswagen Touareg. So far Rainer Zietlow has driven a Touareg along the "Panamericana" from Tierra del Fuego to Alaska in eleven days and 17 hours, from Melbourne to St. Petersburg ("Russtralia") in 17 days and eleven hours, from South Africa to Norway ("Cape to Cape 2.0") in nine days and four hours and from Magadan (Eastern Russia) to Lisbon in six days and nine hours. HID Head Lamps - can they really destroy your ECU/other eletrical components? I've been told the electrical field inside HID bulbs + the ballasts can interfere with other electrics and there for lower the life span by quite a bit. Oh bugger, thanks for the info anyway. Looks like this is gonna be fun then ! Hi mate, the link is broken, can you please send another link to these? I have s similar same fault and can give a very specific reason why some may have this error "P200200: Particulate Trap Bank 1 Efficiency Below Threshold"
When you turn on the ignition the tank pump should run for a few seconds, you should be able to hear that. No need to be insulting about this. I came on the forum to ask advice not for the moderator of all people to call me stupid because of a battery issue. I would definitely ask about the coolant valve. Ask your dealer to check if there are any 'dealer only TPIs' or simply say you've had to top up the coolant. Iirc , somewhere 70-120°C ? And you don't have to have genuine parts . Just had precisely that with my Yeti...but less the noise.